O+ DUO Revealed! An 8 Inch Dual Boot Tab Priced At 6,995 Pesos! Home / mobile / news / o+ usa / O+ DUO Revealed! An 8 Inch Dual Boot Tab Priced At 6,995 Pesos! O+ USA has a great new promising convertible tablet to end the year right! Named as the O+ DUO, the said device is an 8 inch dual boot tablet with good internals that packs both Android 5.1 Lollipop and Windows 10 inside. 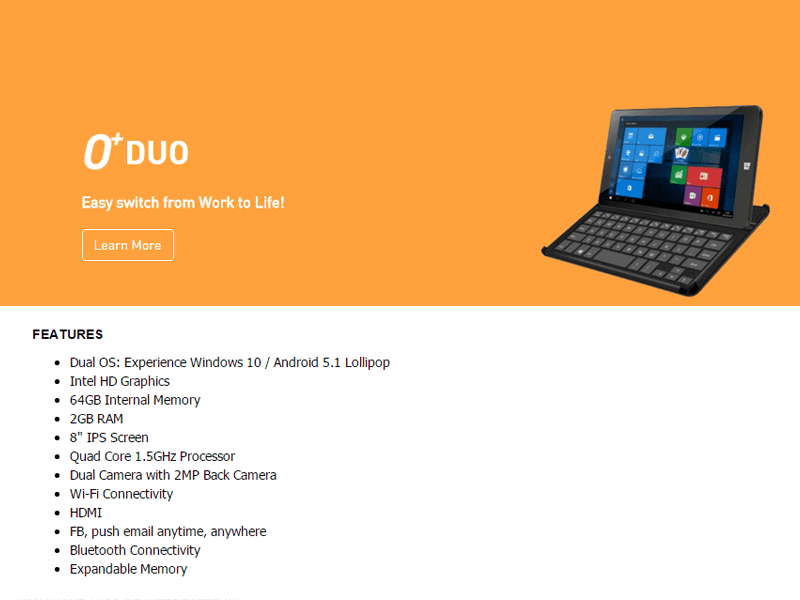 Related: O+ Duo Down To 4495 Pesos, Super Affordable Dual Boot Laptop / Tablet In One! It also rocks an unknown type of 1.3 GHz quad core processor (most like SoFia chips), Intel HD graphics to handle casual GPU requirements, 2 GB of RAM, large 64 GB of expandable internal memory, WiFi, it also has a dual 2 MP camera, Bluetooth, OTG and Micro HDMI connectivity. The O+ DUO also rocks a design that appears to have different modes and a dock-able keyboard. Then our friend Randolph of pinoyscreencast got the official pricing of this highly interesting tablet at just 6,995 Pesos. That makes it a must consider considering the specs and features at that low asking price once it's out in the market.